Fine Arts Center Blog: Winner Updated! | Share Your Holiday Wish + Win Tickets! Winner Updated! | Share Your Holiday Wish + Win Tickets! 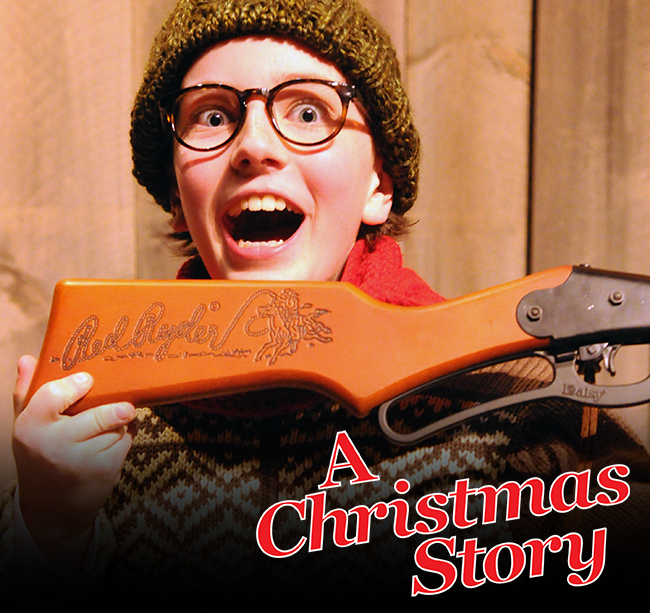 Look how excited Ralphie (played by Evan Lennon) is to have his most prized possession. Photo by Jeff Kearney. For some people, all they want for the holidays is their two font teeth. But if you're little Ralphie Parker from A Christmas Story, all you want in this whole entire world is a Red Ryder BB gun. What's one thing YOU want this holiday season? Share with us by posting in the comments section below, and we'll enter you in a drawing to win two free tickets to A Christmas Story! Official contest rules listed below. UPDATED | Congratulations to our winner, Sunee MacRae! Thank you all for participating and sharing your holidays wishes—we hope they come true! To help get the ball rolling, we asked a couple FAC interns to share what one thing they most want for the holidays. Super generous Kelly (Museum Intern) wants someone to donate to IndyGive! Annika (Social Media Intern) wants a new classical guitar! You can post your comments either via Facebook on this blog, or in the blog comments themselves. However, if you don't leave us some sort of contact information in the blog comments, we may not be able to award you your prize. Blog sweepstakes runs 11/19/12-11/29/12, 12:30 p.m. Contest sponsored by the Colorado Springs Fine Arts Center, 30 W Dale St Colorado Springs, CO 80903. Winners will be announced at 2:00 p.m. MST 11/29/12 via Facebook and Twitter. By participating in this sweepstakes, participants agree to let the Fine Arts Center use their comments in marketing and promotions for the Fine Arts Center. I wish for a Daisy Model 25 BB gun. Much more power and better accuracy than the Red Ryder. A Red Ryder BB Gun! Haha, while that is cool, not really what I want for the holidays. Actually, what I want for the holidays is right here! I am a major fan of the Arts, both performing and craft. Though I am not given the opportunity to see these plays if at all. So I figure I would take a chance here and say my ultimate holiday wish would be to attend one of Colorado Spring's Fine Arts Center's plays. This is truly a classic I wish not to miss out on. I would love to see ten people or families become new members to the CS Fine Art Center in the month of December. Not only do they get to truly be a part of one of the finest arts institutions in the Pikes Peak region; but they get discounts on performances, exhibitions and classes! And there are all kinds of other member benefits, too many to name here. Yep, I'd simply be happy with more members to our FAC family this holiday season. I have two new grandsons born this year and they will both be here for Christmas. I would love to have a new camera - just a small one, nothing fancy - to take pictures while of them and the rest of my loved ones over the holidays. I would like for the remaining $7000 that is needed to activate my husband's memorial scholarship to be funded by the end of this year. I would like to spend time with a bunch of my girl friends who live all around the United States. Although we are far apart in distance, they are in my thoughts often! If I am being totally selfish, I would love a trip to Disneyworld with my husband. I love Disney and have never been to Florida! The best Christmas story, other than the real one in Bethlehem. I already own a leg lamp that is lit in my window every night.... but it's a mini version, only 22" tall. I wish I would get the full size leg lamp this Christmas! How fun it would be to actually win something! My son is moving to Seattle today. I wish we could fly him home for Christmas. I was injured in a serious car accident this year, so between that and ongoing hurtful actions by my in-laws (the latter probably worse than the accident), this has been a hard year for my husband and I. We are financially strapped until insurance money from the accident comes through, and this would make for a nice date night. My Christmas wish is a break from the external things that are stressing our marriage. I wish for The White House and Congress to reach a deal and avert a "fiscal cliff." We randomly chose a winner, and that winner is Sunee MacRae! You've won two tickets to A CHRISTMAS STORY. I have two wishes. I wish that the United States Government will see a "Miracle" this Christmas and will find a way to balance the budget...I also wish a "Miracle" for this nation's people will come together as one heart and find the one thing that is missing in their lives that will make them whole! Hey, I can wish can't I? ?